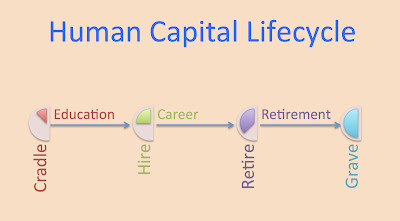 It's funny how in organizations talk about the lifecycle of people. From a full lifecycle perspective, it's "cradle to grave!" 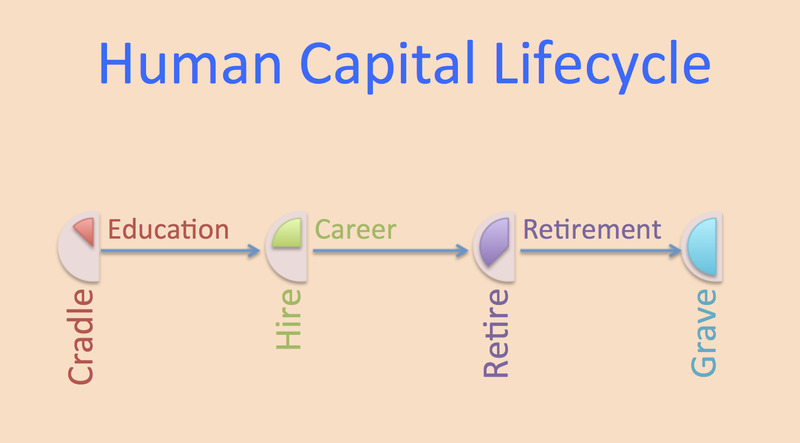 In terms of lifecycle on the job, it's "hire to retire (or to fire)." Really the lifecycles are intertwined. It starts with the cradle...we are born and go through a maturation process that focuses on our education and preparation for life. Then we get hired into our (hopefully) dream jobs, where we spend our careers until we retire--or if you mess up badly and get fired or decide to change career course--you may have to go back to "go" and "do not collect $200" and you get hired again for another career round. Eventually you retire and start your 2nd life in retirement, where please G-d, you have the health and prosperity to enjoy the fruits of your labor and your families. Ultimately, our lifecycle ends at the grave with the death of our bodies--our souls go on to Heaven and live forever basking in the light of the Almighty.